Have you ever wanted to build your own concrete crusher boots, but didn’t know how? Are you tired of other people giving you wedgies when you just want to give one to yourself? Dreamt of drifting away on your own raft? Well, dream no more! I have the book for you! An extremely ridiculous, yet somehow practical and completely nifty tome of crazy inventions is packed with instructions on how to make the above dreams come true. 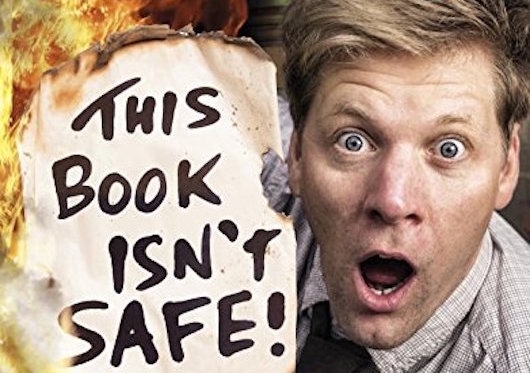 Such is This Book Isn’t Safe by YouTuber Colin Furze. Check out more on his new book, plus some of his other inventions in the videos below. Halloween is almost here! And a fun thing to do for Halloween is to scare up some treats. 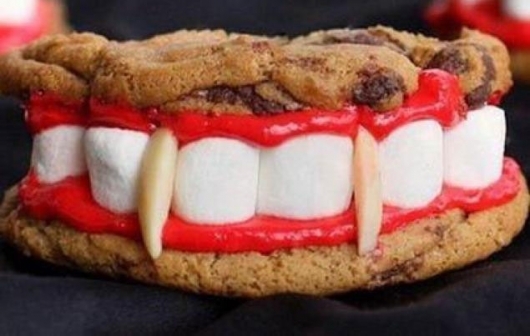 The folks over at Just A Pinch have a simple, easily assembled sugary project that’s perfect for the holiday — Vampire Teeth Cookies! With just 4 very basic ingredients, you can put together these cookies that look so cute and realistic, too! Just get some store-bought chocolate chip cookies (or bake your own if you have the time and inclination), red icing, mini marshmallows, and almond slivers – that’s it! Watch the video tutorial for these cookies here below. Geek gals are always looking for cool apparel, especially when it comes to comfortable swimwear. So, here’s some good news: Now, there’s an Evil Dead-inspired Necronomicon bikini that’s supposedly “super comfortable,” according to its makers. The made-to-order Brazilian-cut silicone bikini, available through Etsy by Bloodlust Productions, is styled after the human flesh-bound Book Of The Dead, the Necronomicon Ex-Mortis, from Sam Raimi’s original Evil Dead movies. Check out photos of the bikini being modeled here below (via the product page). You’ll notice that this creation was very strategically designed.